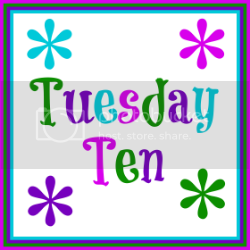 Since yesterday was Memorial Day, which is often considered the "official" start of summer, Rabia and I thought it would be fun to share our Summer Bucket lists for today's Tuesday Ten! I made a bucket list last summer. I actually printed it, put it on the refrigerator, and we had fun crossing things off together. I even gave an update at the end of summer sharing all the things we had actually done from the list. I'm a list maker by nature, so I love doing things like this! The only problem is, my bucket list is longer than ten! There are things on the list I know we will do (i.e. We already have two beach trips planned) and things that will be more challenging (i.e. traveling somewhere new). I hope we can get to them all and that I can give another update later this summer. What's on your "To Do" list for the summer?? Meet our co-host for the month of May, Mrs. Tee!! Please make sure to check out her blog and follow her on social media! Come link up again next Tuesday, June 3 when we'll be sharing the songs that are currently stuck in our heads! We went to a baseball game this weekend! It was a lot of fun, especially since our team won! "Night swimming" makes me think of the REM song. It's one of my favorites from them! Sounds like a great list to me. I fulfilled one of my summer bucket list items this past weekend. We went to Seattle for the first time. I'm so bad about getting our summers organized. We typically just fly by the seat of our pants the first month, and then try to get our act together when everything else structured is already filled up. Oh, I am so ready for summer Janine! Ha! We have a pool and my kids love to wait until it's dark so we can swim wight eh pool lights on. It give the water a very cool glow. However, it doesn't get dark until late in the summer and it has been a stretch to let them stay up that late! Sounds fun! I have never been to Seattle. Hubby is working on a business trip to San Francisco and we are hoping it will work out so we can tag along! 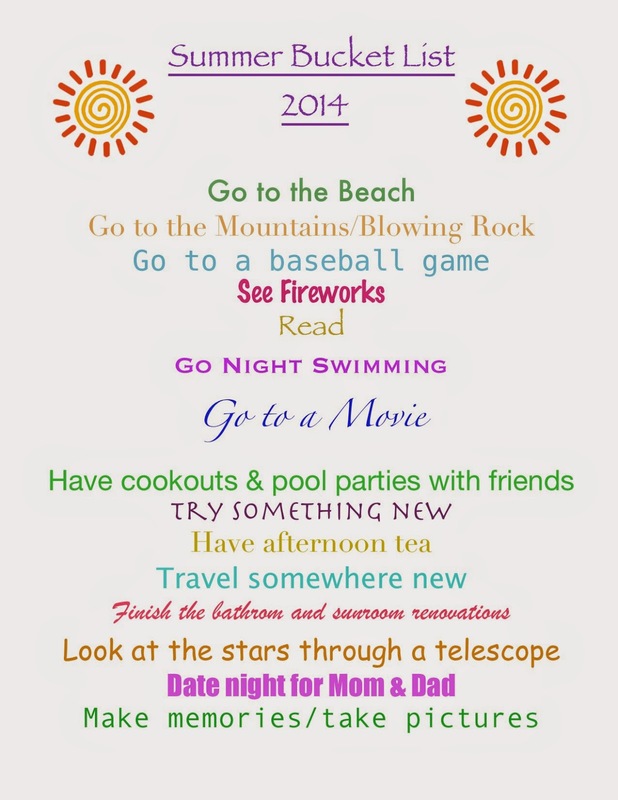 I love the idea of a summer bucket list! I am going to have to give this some thought. "Look through a telescope" is a good one! I like that. Go to a movie is such a good one. Before kids it would be such a thing to do. Now it happens maybe once or twice a year. I like to go alone actually. Cassidy goes all the time after the kids are in bed and I'm working! We got our oldest a telescope for Christmas 2012, but we have rarely used it. It is either too cold in the winter or it's too late when it gets dark enough in the summer. This summer, we're going to do it! We rarely go to movies. My middle one doesn't like them and they are so darn expensive for all 5 of us to go! Of course, there has to be something worth seeing, too. Great list. We've already been to the beach a couple of times, and it's not even warm out! We're looking forward to new adventures. I have a Maine state park pass and the boys have a passport where they collect stamps from each park. Can't wait to see how many stamps we can get this summer! Night swimming? That sounds like fun and it's something I don't think I have ever even thought of. Great pick Lisa! The state of Maine publishes the passport to encourage people to travel around the state. It's really cool. The boys earn prizes as they accumulate stamps. They got a magnet last weekend! You are WAY ahead of me! I have nothing planned. The only thing I know for sure is that we will have family visiting pretty much all summer and we are going to the Jersey shore for my aunt's 80th at some point. I have a feeling the summer is going to fly. We have a Planetarium close by that we've never been to. They have free shows every Saturday. I'm actually kinda embarrassed that we've never gone! I'm adding that to our list for he summer! Your list is all fancy and cool! Ha! Yes, winter was brutal. I'm ready for summer, but I might change my mind by August when I'm melting! It always flies by, doesn't it? I love it. Night swimming is the BEST. Can you count BlogU as your new place? Here's to trying something new. I think we're going to go to Ocean City NJ for the first time this summer and I'm excited. It'll be fun to cross off your items as you make it a great summer, Lisa! Oh, the alphabet thing sounds fun, Robin! David and I still do our Friday lunch dates whenever he's home, but it doesn't work in the summer because the kids are home, too. So, we try to get in a couple of those date nights. She Had Me At "Cookie!"